1. In a mortar and pestle, crush green chilies, garlic cloves and cumin seeds. Add it to the grated coconut and combine well. 2. Heat 1 tbsp oil in a pan. Splutter mustard seeds and fry dry red chilies and raw rice. When raw rice turns golden brown, add the chopped kale and chard. Mix well and bring down the heat. Make a well in the center of the pan and add the crushed coconut mixture. Cover the coconut mixture with the kale and chard. Cook for about 3 minutes at low heat.Open the lid, add cooked black eyed peas and mix well. 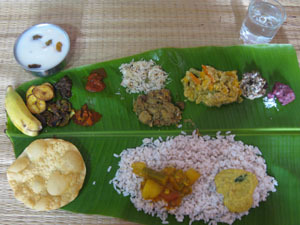 Again cook for 3 – 4 minutes until the leaves are cooked and thoran is dry. Serve with rice and other side-dishes.